Ready to party in an upscale bar turned venue on the East Side of Austin? A normal spot for Austinites to sip on a handcrafted drinks will be transformed for a set of moody and upbeat shows. At SXSW, you can enjoy these tunes sprawled out on Weather Up’s massive lawn. 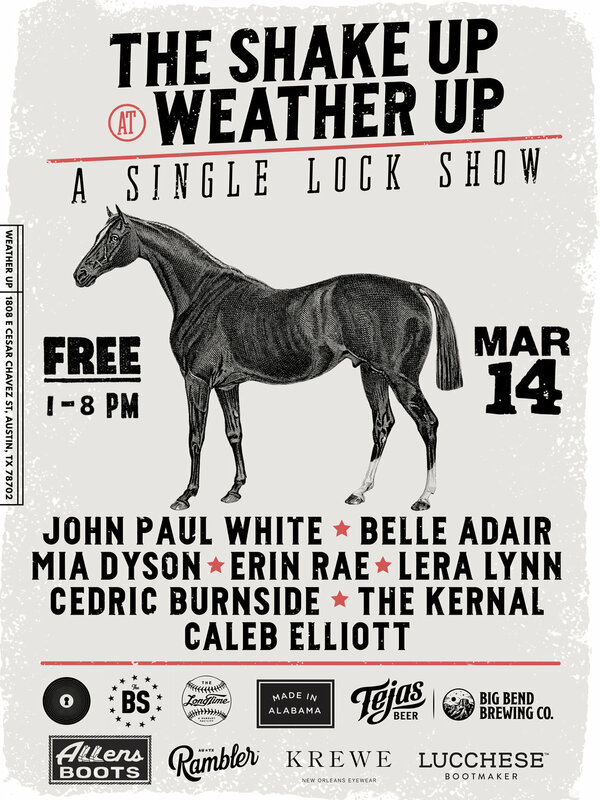 Single Lock Records has gathered a host of Western inspired brands and that leaves us with quite the tendency to throw on our boots for this show. One thing is for sure, the beer selection will be on point. Between Tejas and Big Bend Brewery, you can’t go wrong. There is also another new drink on the scene, Rambler sparkling water for those not partaking in the booze selection. Will Rambler topple Topo Chico’s reign? Guess you need to come and try it to decide. John Paul White, Belle Adair, Mia Dyson, Erin Rae, Lera Lynn, Cedric Burnside, The Kernal, and Caleb Elliott. Our top picks for this show are Mia Dyson and John Paul White. Mia’s single entitled “Fool”, is an upbeat anthem for believing in yourself. It really has us pumped up. On the other end of the spectrum, we have John Paul White. His tunes are soulful and won’t leave a dry eye in the place. If you thought he sounded familiar, I’ll just leave this Barton Hollow video here. It should jog some memories. View the poster above for all the details and the very punctual looking set times. Single Lock has their ducks in a row. As always, RSVP before setting foot on Texas soil. You do not want to miss out. Sign up here.